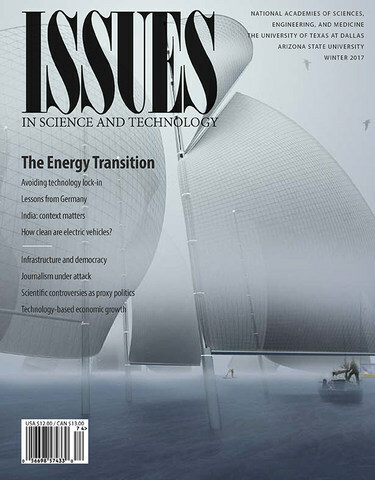 In the Winter 2017 edition of Issues in Science and Technology environmental journalist Keith Kloor describes a number of incidents in which advocacy groups have attacked reporters for citing reliable scientific evidence that undermined the claims of those who questioned the value of vaccines or the safety of genetically engineered crops. Their tactics included ad hominem critiques of the journalists and Freedom of Information Act inquiries to determine if scientists were talking to journalists. Kloor argues that these tactics are making it much harder to include the most trustworthy scientific information in news stories. Also in this issue, four articles take distinctive looks at energy technology innovation. Varun Sivaram highlights the danger of technology "lock-in" as a barrier to continuous progress. Christine Sturm provides an insider's view of the shortcomings of Germany's ambitious green energy program. Kartikeya Singh takes a ground level view of the challenges facing energy implementation in India, and Jack Barkenbus shows how the environmental benefits of electric vehicles can vary considerably from country to country and region to region. Christopher Jones and David Reinecke look back at the US history of infrastructure investment and derive lessons for how Donald Trump can most effectively implement his promise to improve national infrastructure. Gregory Tassey provides a detailed analysis of the limits of monetary and fiscal policy as a means to boost economic growth and explains how investment in research and technology is essential to boosting productivity and thus growing the economy. Daniel Hicks shows how even scientists use criteria other than scientific evidence in forming their policy positions. Thomas Woodson explores how scientists can play a vital role in reducing racial tension. Philosopher of science Robert Frodeman contributes the first article in what will be a series of short perspectives that take a deep look into the position of science in society and policymaking. ISSUES IN SCIENCE AND TECHNOLOGY is the award-winning journal of the National Academies of Sciences, Engineering, and Medicine, the University of Texas at Dallas and Arizona State University. issues.org.